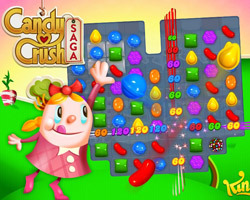 Candy Crush, the popular mobile game that’s played by almost every girl in my school, is getting its own game show . announced on Tuesday that it is teaming up with King James and Lionsgate to produce the Game series. Details on game mechanics are still sparse but the network did explain that 2-person teams will “use their wits and physical agility to compete on enormous, interactive game boards.” The series will be produced by Matt Kunnitz, the guy behind Fear Factor and Wipeout, however there’s no word yet on who will host or when the series will premier.